I like stuff that lasts, and vice versa. Last week, the Frigidaire refrigerator we bought in 1998 died suddenly, less than a year after the warranty expired. I discovered fridge warranties aren't what they used to be - the White Westinghouse box we bought to replace the dead machine coming with only a paltry one-year warranty, although I think my credit card will double that. The annoyance and unwelcome expense of having to replace the fridge got me thinking about another piece of 1998-built equipment I own - my WallStreet PowerBook, which unlike the Frigidaire is still going strong in its eleventh year of service, currently on long-term "loan" to one of my daughters who is successfully running Mac OS X 10.4.11 on it. An apples vs. refrigerators comparison to be sure, but it is gratifying that the old Mac laptop is still hanging in and capable of providing useful service. 233 MHz processor with no Level 2 (L2) cache, a 66 MHz system bus, 16 MB of RAM, a 2 GB hard drive, a 12.1" 800 x 600 passive matrix screen, and 2 MB of video RAM. There was no S-video port, and the modem was an optional extra on the base model. You could optionally get a 13.3" or 14.1" screen. I used one of these as my production machine for a few months in late 1998 and liked it a lot, not minding the passive matrix display as much as some folks did, and while the lack of an L2 cache hobbled its performance somewhat compared with the WallStreets, it was certainly a lot faster than the PowerBook 5300 that I was used to! 250 MHz or 292 MHz G3 processors with 1 MB of L2 cache and an 83 MHz system bus. The 250 MHz machine came with 32 MB RAM, while the 292 MHz unit shipped with 64 MB of RAM. WallStreets had either a 13.3" or 14.1" 1024 x 768 screen with 4 MB of VRAM, a standard S-video out port, and A 56K modem. Either 4 GB or 8 GB hard drives were available, and high-end models came with a floppy drive expansion bay module as well (optional on other models). Both the MainStreet and WallStreet came with 20x CD-ROM drive expansion bay modules, and a DVD ROM drive kit was offered (but rarely supplied) for the 292 MHz WallStreet. All of these machines had SCSI, serial, ADB, and 16-bit sound-in/sound-out ports, an ethernet port, an infrared port, two PC Card bays, and stereo speakers. They all had two expansion bays, either of which could support a lithium ion battery or a variety of expansion bay devices. 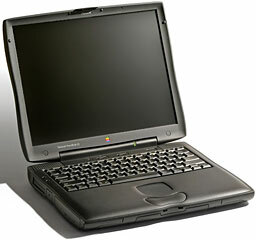 The PowerBook G3 'PDQ' came along in September 1998 as a sort of second-generation WallStreet. The WallStreet name is now generally applied to both May 1998 and Sept. 1998 G3 Series PowerBooks, but the origin of the 'PDQ' code name is rumored to be from Steve Jobs' decree that problems besetting the early PowerBooks G3 series get fixed 'PDQ' (pretty damn quick). Another reason for the mid-life revamp was that PowerBook production was shifted from Apple's own facility in Cork, Ireland, to subcontractor Quanta, in Taipei, Taiwan, the company that still builds (and helped engineer) MacBooks and MacBook Pros for Apple. All PDQ units have a 66 MHz system bus, a full slate of ports including S-video out, standard 56 K modems, and a 20x CD-ROM drive. The 233 MHz and 266 MHz machines came with 32 MB of RAM, while the 300 MHz machine shipped with 64 MB of RAM. The floppy drive was phased out. The troublesome 13.3" screen was also dropped, and the 14.1" 1024 x 768 monitor and 4 MB of VRAM was standardized across the line. However, about a month after the PDQ debuted, Apple released a low-end replacement for the MainStreet, which has come to be known as the "WallStreet LE". This machine had most of the good stuff shared with its more expensive siblings, but wit as limited to availability with the 233 MHz G3 with 512K L2 cache and a 12.1" 800 x 600 active matrix TFT screen with 2 MB of VRAM. I bought one of these units (referenced above in my preamble) in January 1999. While the 266 MHz and 300 MHz PDQs are nominally a bit faster than their 250 MHz and 292 MHz WallStreet counterparts, there isn't much difference, as the slower system bus on the PDQs cancels out most of the speed advantage. The 233 MHz PDQ/LE is almost equivalent in performance to the original 250 MHz G3 Kanga, thanks to its 66 MHz bus versus the Kanga's 50 MHz bus. New features introduced with the WallStreet family were an fn modifier key and moving the screen brightness control to a console above the keyboard, along with a volume control, a mute button, and the power button. A quick-release keyboard made installing memory upgrades and access to the hard drive a snap. Another change ushered in with the WallStreet was that the stickers bundled with every Apple CPU were changed to white from the original six-colored Apple logo. Unlike Apple's present day parsimony with bundled cables and adapters, the PowerBook G3 Series machines came with a VGA adapter, an S-video adapter, an ethernet cable, and a phone modem cable, all in classy black to match the PowerBook's charcoal livery. The G3 Series WallStreet machines were the last PowerBook with what we had come to regard as a "standard" set of PowerBook ports - ADB and serial ports, an HDI-30 SCSI port, ethernet, an internal modem, a video out port, plus an S-video port and an infrared (IrDA) port, two CardBus slots, and two removable device/battery bays. There were two RAM slots supporting (eventually) up to 512 MB of RAM, and the processor was mounted on a removable daughtercard, which was later to facilitate a thriving market in faster G3 and G4 processor upgrades for the WallStreet. The WallStreets weren't entirely modern, being the last PowerBooks without USB support and the last but one without FireWire (both could be retrofitted using CardBus adapters, which is what I did). They were also the last 'Books to use "Old World" ROM, which was to somewhat compromise their flexibility running OS X - they do officially support up to OS X 10.2.8, and, as my daughter has established, it is possible to install up to OS X 10.4.11 - perhaps even OS X 10.5 "Leopard" with a G4 upgrade and hacking the installer. The WallStreets were pretty rugged, as my going-on-11-year-old unit attests, but they did have some problem issues, including power manager board failures in early units, a tendency for the power adapter barrel connector to short out on the machine's RF shielding, and maddening ribbon cable video connector problems with the 13.3" displays. Perhaps worst of all, many PowerBook G3 Series owners experienced broken display lid hinges during their second year of ownership. The hinges (or "clutches", as Apple referred to them) provide friction to keep the display at a static position when open. Without this friction, the display falls flat onto the nearest surface. Users reported that the display hinges would fail under moderate to heavy use - ranging from three to eight opening/closing cycles per day. For busy professionals - the target market of these machines, failure seemed inevitable. Typically failing on the right side of the computer first (being the side that received most of the opening strain from right-handed users), the hinges on these Wall Street and PDQ computers would loosen over time, then snap suddenly, leaving a jagged metal edge that could easily cut the display cables routed over them. If the broken clutch was not repaired, the remaining clutch would also fail, rendering the PowerBook useless for portable use. Affected PowerBooks had to be shipped to Apple's Texas PowerBook repair center, and the job was subject to Apple's Tier 1 flat repair fee of $310 plus the technician's time - and you lost the use of your PowerBook for ten days or so. I endeavored to treat my WallStreet's screen hinges gently and as seldom as practical over the years, and they've never failed, although the screen has become a bit floppy when open. The major issue I experienced was a sudden processor failure on August 2, 2002, which knocked the WallStreet out of service for several months until I scrounged up a replacement processor daughtercard. Since then it's been entirely dependable. In my initial musings back in 1998 I said, "I think that the G3 Series will live on long past its production life, much as the 500 Series has done, as one of the best-loved PowerBook models ever." One of my better calls. For more on these notebooks, see Low End Mac's Compleat Guide to the WallStreet PowerBook G3.